If you're on a boat, then make this Boat House Punch. It's got gin, champagne, Aperol, St. Germain, and plenty of fruit juices. It's slightly sweet, slightly bitter, and slightly sour, and very boozy. If you want to go old school, then the Garrick Club Punch, which originated at the namesake club in London in 1835, will do the trick. It's like a sophisticated adult lemonade with gin, Grand Marnier or maraschino liqueur, and plenty of fresh lemon juice. My friends still claim it's the booziest lemonade they've ever had. If you have a trash can, then this Bourbon & Watermelon Punch has, get this...two ingredients. Just add your favorite bourbon (preferably a mid-range because this punch has two ingredients, remember?) and fresh-squeezed watermelon juice. It's incredibly refreshing and will be amazing paired with BBQ and grilled meats. If you're at a brunch, then make this twist on a French 75, with this Sunset French 75. Instead of the usual gin, lemon juice, champagne, and sugar cube, this version calls for gin, blood orange juice, champagne, and a little lemongrass simple syrup. Everyone does mimosas and bellinis, so why not think outside of the box? Your friends are sure to be wowed and tipsy, plus, you can have this punch on a boat or in a trash can! I've been in a seafood mood as of late, and perhaps it's because LA was experiencing unseasonably hot temperatures for the past couple of weeks. In other words, I wanted something light and fresh. This "Saucy" Sautéed Shrimp with Lemon Quinoa from The Kitchn was just the thing I needed for a warm Sunday evening. The white wine sauce is further enriched with shallots, garlic, red bell pepper, and sun-dried tomatoes. I used jarred, julienned sun-dried tomatoes to get a little more flavor from the oil. Pick a bottle of nice, full-bodied white wine to cook with and that you'd also like to polish off with the meal. I popped open Sanford's Chardonnay, which is crispy and light on the oak finish. It also happens to be a favorite of The Lush Chef's mama (sorry, you weren't with me to share, mom!). Any size shrimp is actually fine, and I opted for a larger, pink variety. I plan on cooking the quinoa with wine and lemon again to use in salads, as a side dish, or the base for other recipes. This meal also comes together quickly, so it's great for weeknights and lazy Sundays. - Rinse that quinoa well in a fine-meshed sieve under running water. - In a medium sauce pot over medium heat, add a drizzle of olive oil. - Add the drained quinoa and lightly toast, stirring for about 1 minute. - Add the salt, lemon juice, 1/4 cup of the white wine, and 1 1/2 cups water. - Bring to a boil, cover, and reduce the heat to a simmer, letting the quinoa cook for about 15 minutes. - While the quinoa is cooking, place a large skillet over low heat and melt 1 Tbs of the butter. - Add the garlic, shallots, red pepper, and tomatoes, stirring frequently until the garlic and tomatoes are softened and fragrant. - Turn up the heat to medium and add the second Tbs of butter and the rest of the white wine. - Whisk constantly, bringing the wine to a simmer, and cook until the mixture is slightly reduced and shiny. - Turn down the heat to very low to keep the sauce warm. - In a separate large sauce pan or skillet over high heat, heat the remaining Tbs of butter. - Add the shrimp and sear them quickly until cooked (about 1-2 minutes). - Add the shrimp into the pan of sauce and veggies and toss in half of the parsley. - How's that quinoa doing? Turn off the heat, and let it stand covered for about 5 minutes. - Remove the lid and fluff the quinoa. - Stir in the lemon zest and the remaining parsley. - Divide quinoa evenly amongst plates and top with the shrimp and veggie sauce. If you have any more lemon zest and parsley, then sprinkle some on top! This past March, my friend and I did a little urban distillery tour through Portland. You can actually get a Distillery Row Passport for $25 with a $5 coupon at the airport and most hotels, so it's a pretty sweet deal. Grab a passport and a fixed gear bike, and you're set. Anyway, my friend and I were absolutely smitten with the Ginger Liqueur at New Deal Distillery. It's just fresh ginger infused in a neutral grain spirit, and finished off with a little organic sugar cane and agave. It smacks of spicy, fresh ginger, and as I tasted it, I began envisioning all the Moscow Mules and gingery punches I'd be making this summer. Well, I finally got around to making a drink over a month later for some friends at a Sunday dinner, and this is what I came up with - the Gin Gin cocktail with gin and ginger liqueur. The name is a play off of one of my favorite candies - Gin Gins. I used St. George's Botanivore Ginger, which is heavier on the juniper, citrus, and floral notes, and added a little lime juice (in the words of a bartender friend, "drug lords, be damned") and simple syrup. I topped it with a mint leaf for another fresh, herbal hit. My friends and I quickly realized that this drink may have become our spring/summer jam. I better order another bottle of this liqueur soon! - In a cocktail shaker filled with ice, add the gin, ginger liqueur, lime juice, and simple syrup. - Shake to your heart's content and pour into a chilled glass. 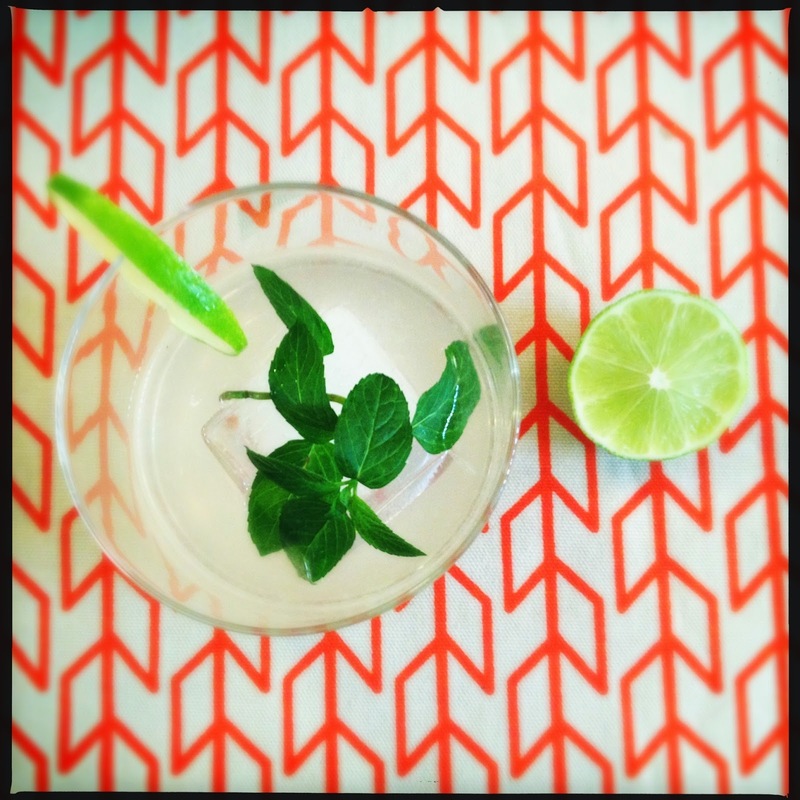 - Top with a mint leaf and garnish the glass with a lime wheel. I had bought a ton of fresh peas from the Farmers' Market last weekend without thinking about what I was actually going to make with them. I used to hate peas as a child. I mean, truly, truly despised them. Perhaps it was because we only got the frozen kind, and they were thawed out in the microwave. After buying them fresh, now I just love them. I was having a few girl friends over for Sunday dinner, and I wanted something easy and light tasting. Food & Wine had this beautiful recipe in their April issue for Salmon with Mashed Peas & Tarragon Butter from Viña Casa Marín, a Chilean Winery, that captured the beautiful colors of spring. I took a little trip to Santa Monica Seafood for some fresh salmon, and got a little sidetracked by the oyster bar. There's nothing better than treating yourself to a few freshly shucked oysters on a Sunday afternoon. For the wine, use a dry white such as a Chardonnay or Sauvignon Blanc—something that pairs well with the fish. If you don't have a grill pan to get those lovely grill marks, just use a regular sauté pan. This recipe comes together quickly and I just absolutely loved the herbed butter sauce in it—it's divine drizzled over the salmon and peas. At least you're getting your veggies, so all that butter offsets it, right? - In a large sauce pot of boiling water, cook the peas until tender, about 3-4 minutes, and drain. - In the same pot, melt 1 Tbs of butter in the cream. - Add the peas and mash with a potato masher until it's chunky (you don't want a smooth, perfect mash here). - In a small saucepan, simmer the wine with the lemon juice over medium heat until reduced to about 1 Tbs (about 8-10 minutes). - Reduce the heat to low and whisk in the remaining 6 Tbs of butter, one cube at a time, until the sauce is thickened. - Whisk in the tarragon and season with salt and pepper, and turn the heat off. - Heat a grill pan or sauté pan over medium heat. - Rub the salmon fillets with olive oil, salt, and pepper. - Grill the salmon, skin side down, turning just once, until just cooked through (about 10-12 minutes). - Spoon the mashed peas onto the plate and top with the salmon, skin side up. - Spoon the tarragon butter over the salmon and serve immediately.